You are here: Home / Articles / Key Control Systems / Key Control Systems – What’s in a Name? Key control and management systems are most easily defined as an orderly and secure solution for the management of keys. 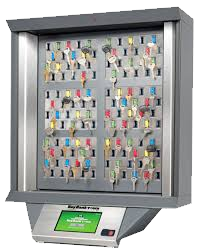 Due to their increasing popularity, key control systems are also known as automated key systems, electronic key systems, key management systems, computerized key systems, key bank systems, key storage systems, key tracking systems, and so on. Regardless of the name given though, the automated systems address security and location issues related to the management and control of keys that need to be accounted for and secured when not in use. The systems are designed so that only pre-authorized users can access the cabinet and all transactions are recorded to provide an audit trail of who accessed the system and when. From single key cabinets to those used for securing hundreds of keys, solutions for key security, key control and key management can be tailored to a variety of management and application needs. Their smart, tamper-proof designs help to reduce wall space and they can be optionally accessed with pass codes or biometrics. Key control and management systems, by any name, are a valuable and reliable way to manage, control and secure physical keys.